"Express Delivery is our Promise to you" Delivery cut-off time 5:00pm. All orders before 5:00pm will be ship out on same day. 90% of our customer receive on Next day. Normally can receive within 1 to 3 days depend on your area postal code. THIS ITEM CANNOT SHIP TO SABAH SARAWAK. 100% Original Xiomi power bank, imported. Ready Stock. Secured Packaging, we use Bubble Wrap Packaging to make sure products reach to you in safe condition. We take full responsibility of any damage during shipping. Customer Service, Our dedicated Customer Service make sure to provide highest possible before and After Sale Service. Satisfaction Guaranteed, Customer Satisfaction is very Important for us. If you are not satisfied after purchase please let us know and we will provide resolution accordingly. 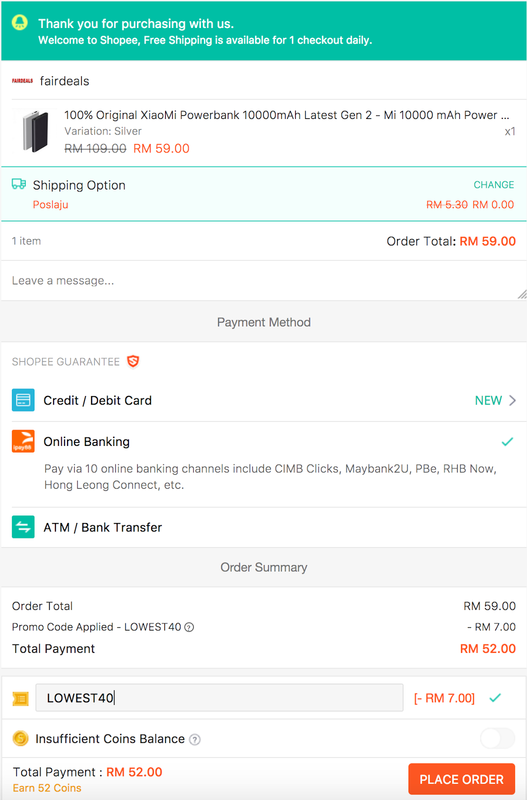 Apply Shopee Malaysia Promo Code: LOWEST40 to get additional RM7 discount off the order price (RM59 - RM7 = RM52). Harga Runtuh's Pro Tip: Official Mi Store @ Lazada Malaysia is currently selling 10000mAh Mi Powerbank 2 (Silver) for RM85 so the current price offered by this Shopee seller is definitely a great bargain offer if you been eyeing for this second generation of Mi Powerbank since it was launched end of 2016!